While looking over the new 5th Edition Dungeons and Dragons Dungeon Master’s Guide, I was thinking about the game value of the “advantage” and “disadvantage” system when applied to percentile dice. “Advantage” and “Disadvantage” in D&D 5th Edition is granted whenever your character should get superior or inferior luck on a roll due to circumstances. For example, attacking a prone enemy in melee, you’ll get advantage. They would roll two d20s instead of the normal one, keeping the higher value. For disadvantage, use the lower value. 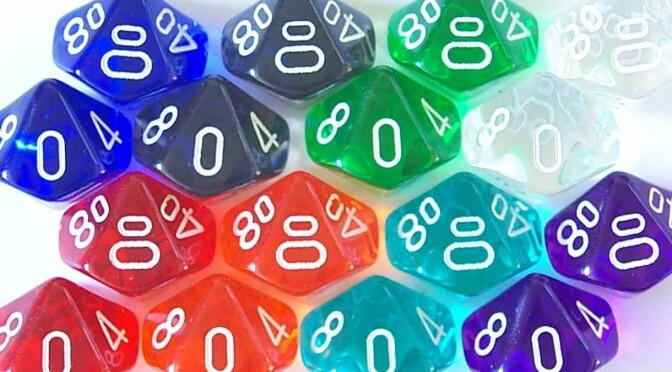 Percentile Dice: Rolling two 10-sided dice to produce a range of values from 1-100, by identifying each die as the place in a 2-digit number (and treating 00 as 100). Some dice are designed with a 10s place so that it is determined ahead of time. How would you use advantage on a percentile dice? When a player has advantage on a percentile roll, rather than choosing which die is the 10’s place and which is in the 1’s place before rolling, they will use the higher number in the 10’s place. For disadvantage, they use the lower number in the 10’s place. Standard Roll Choose a die to be the first digit and another to be the second before rolling. Advantage After rolling, choose the higher die for the first digit. Disadvantage After rolling, choose the lower die for the first digit. How would this affect the math? I’m glad you asked. For d20 advantage, the average result after 10,000 calculations is just below 14. For disadvantage, it hovers above 7. 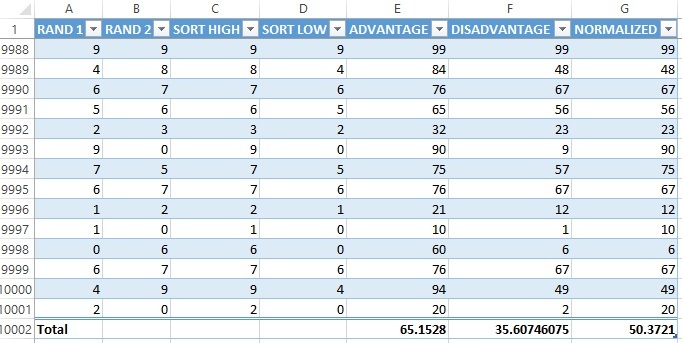 Sample data for Percentile Advantage. The “Normalized” column is using the standard “pick the first one” rule. Ten thousand calculations later, and the advantage seems to average above 65% and disadvantage at just below 36%. Compare that to the numbers for the d20s. If we multiply the d20 results by 5 to get equivalent values, we see something interesting. The d20 advantage translates to 69.488, and the disadvantage translates to 35.8705. It’s roughly the same results. 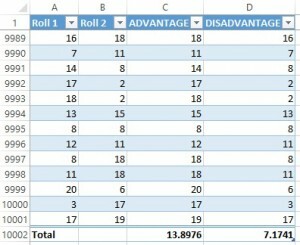 It seems to me that if you want to give your players advantage and disadvantage on percentile rolls, and have the gains be roughly the same as those for d20, you can follow the method above for good results. Side Note: If this has been discussed elsewhere, I apologize. I was thinking about it, explored it, and wanted to share.